Each February the Piedmont Landscape Association in central Virginia creates a Valentine to the plant world and its workers: the growers, designers, plantsmen and plantswomen who paint in plants. 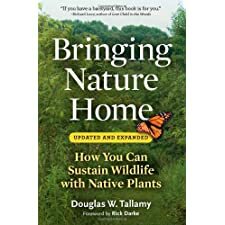 This year's PLA winter symposium featured Dr. Doug Tallamy of the University of Delaware, author of Bringing Nature Home, a Timber Press release, and now, a re-release. Dr. Tallamy and other stars of the horticultural world enthralled over 600 gardeners in the packed Paramount Theatre on the downtown mall in Charlottesville; in Tallamy's case, with pictures of - gasp! - caterpillars. These action shots of caterpillars consuming native plants - most photographed in Tallamy's yard - were an unlikely inspiration for those who are often asked by clients to pick, smash, burn, poison, explode or just deter those caterpillars from eating any single leaf on 'their' plants. And as a result, many years of accumulated experience go into creating plant 'palettes' for 'low-maintenance' landscapes based on plants that have little appeal for these caterpillars; in other words, we prepare a banquet for our own human visual and sometimes olfactory entertainment that is also made to be un-appealing and dis-tasteful to these creatures. Our landscape design clients who dislike the munching caterpillars often ask for 'butterfly' gardens to be composed by us, their dutiful landscape designers. (The notion of metamorphosis for lepidoptera has escaped some of us, if not our children). And, we and our clients often go to great lengths to feed birds year-round, when what is crucial to biodiversity, particularly diversity of migrating birds, is the availability of food rich in protein during nesting and fledging season. What food do birds prefer and need greatly at this critical time? Well, the bugs and caterpillars.of course. Dr. Tallamy and his students research and publish the links between the food needed, and food provided in the regions where we live, particularly the midAtlantic. Critical to the entire food chain in any ecosystem are the plant genera that support the greatest numbers of lepitoptera and other 'bugs' in each region. Plants, large and small, feed the critters, and they in turn feed the birds, and on and on. Eventually, we too are fed. At a time when food, and eating local, is tres chic, au courant, de rigeur, the zeitgeist, we often deny the birds in our flyways the same opportunity. We lay a banquet of foreign, strange and sometimes unappetizing material for them, and tease them with 'melting icebergs' of large expanses of foreign, clipped, never-blooming turf grasses, dotted with single 'specimen' trees and shrubs from other places, rather than a knitted-together community of native trees, shrubs, herbaceous perennials, grasses and forbs. And of course, the berries and other snacks on the foreign shrubs that birds DO find appetizing, end up being propagated by them. In the right conditions, these invasives then roll like a mighty tide right over the native plants. Think berberis (barberry) hosting increased tick populations in the woodlands of New Jersey and southern New England, and privet (ligustrum amurensis) colonizing the piedmont and coastal plains of South Carolina and Georgia. (There is a singular virtue, after all, in clipping privet hedges into rectangles: denying birds the berry/seed to propagate an invasive pest). So. What? you say. So, many thanks to Dr. Tallamy and his researchers for providing a list of the top 20 woody trees and shrubs and top 20 herbaceous perennials, grasses, forbs for supporting biodiversity in the midAtlantic. This single page handout was worth the price of the day's admission. We now hand out this list at speaking engagements and to each client in our initial landscape design consultation. Gardeners and designers love lists: look at the back of any catalog. My teacher at Kew, the British landscape designer and writer John Brookes, opened our History of Garden Design lecture with a deceptively simple statement: "Gardens are a product of the culture in the time and place they are made." Your landscape designer, gardener, landscape contractor and maintenance crew may not tell you they have suddenly converted to stewards of the ecosystem in your yard. In fact they will probably be quite reticent on the topic. But stealthily and steadily they will begin to suggest different plants, native replacements for the Norway maples and other strangers in your midst. A generational shift that began in the sixties and seventies will shift almost all gardens in the midAtlantic in the next decade. Individual single family homes with individual yet identical turfgrass lawns - the archetypal American expanse - limitless, with no walls or hedges to define each suburbanite's plot, will become right-sized and sized for a purpose. Grass? Who needs it? Well, children do. Players of sport do. Those of us with Seasonal Affective Disorder do, Rather than the development default, turfgrass lawns will become one design element, but by no means the most important element, of the designed landscape. Our gardens will be designed for people, yes, as Thomas Church so rightly pointed out, but also for a more permanent, sustaining culture, not just human culture. Permaculture speaks of forest gardening, and Bill Mollison's most exciting lectures in our permaculture design course were of 'weaving', 'stacking' or layering productive systems on land and water as Nature does. Could it be that we are on the verge of unifying our notions of beauty with a reawakened sense of stewardship? If so, we have a few important teachers to thank, and Dr. Doug Tallamy is among them. A deep, prayerful bow seems the right expression of gratitude. The twenty woody plants, and the twenty herbaceous perennials, grasses and forbs, will inspire us this spring in this blog and in our design work for some time to come. Stay tuned, and walk in beauty. I love reading sane positions in the lawn debate. I like my grass, for croquet, and overflow entertaining space, and for a visual respite from plantings - but I sure wouldn't mind a little less in my yard. I can't believe I haven't read your blog before, especially since we're practically neighbors!